Update: as of 29th of June 2016 I certified in this area, you can read about it here. Software Improvement Group (SIG) recently released Building Maintainable Software, Ten Guidelines for Future-Proof Code. In this post I will summarize the ten guidelines and look at some of my code to see where I improved and what I can do better. This short guide (134 pages, excl. appendix) is a compact guide to help you write maintainable code. It also serves as preparation for the Quality Software Developer Foundation Certificate in Maintainability. Why is maintainability important? Maintaining source code takes at least twice as long when maintainability is below average (as measured by SIG). If code is not maintainable changes to the codebase are risky and easily introduce bugs. This can even lead to the system being written off before initial release. Each guideline has concrete / easy-to-understand Java code samples. At the end of each guideline chapter the author tries to take away common misunderstandings (statements like “our domain is very complex, therefore hight code complexity is unavoidable”) and shows how SIG rates the guidelines on real source code. It is really hands-on. Shorter units (that is, methods and constructors) are easier to analyze, test, and reuse. Most of my refactoring falls into this guideline I think. The book prescribes a simple rule: methods of 15 lines or less. self.html = "<div id='content' style='font: 85%/1.6 Verdana, sans-serif;'>"
So this should be broken apart into two or more methods. It is cool to see how metrics (LOC per method) reveal these kind of issues. Units with fewer decision points are easier to analyze and test. I still get them occasionally when the architecture is not well defined upfront or requirements change dramatically in the process. I hate ending up with code that has deep nesting, because it is inherently complex. The book has a great refactoring example of a switch statement (getFlagColors) to a Map data structure with a method to retrieve a flag from it. It comes down to splitting growing methods (size and nesting) into smaller methods. Hence it overlaps with the previous guideline. Duplication of source code should be avoided at all times, since changes will need to be made in each copy. Duplication is also a source of regression bugs. This is probably the easiest to grasp / fix, however I am surprised how often I see repetition of some kind when I look at code. print "wake up and go for a swim"
print "wake up and go for a walk"
I try to be ruthless when coding and address even trivial examples as above. Get rid of “code smell”, keep it DRY! Units (methods and constructors) with fewer parameters are easier to test and reuse. Why not passing in blog object that holds all the data, but only causes a single parameter to be passed along? Modules (classes) that are loosely coupled are easier to modify and lead to a more modular system. We should split these functionalities into different classes: GetData(), ParseData(), CreateOutput(), PrintOutput(), MailOutput(). This makes it more modular. Also note that I kept the class names generic so when we decide to print/mail plain text instead of html it is easy to add. Top-level components of a system that are more loosely coupled are easier to modify and lead to a more modular system. For example when you have classes Input -> Output -> Logging -> FileHandling -> XMLParsing -> etc. - make sure these components operate independently, passing the Logging object to all the other modules and vice versa creates more dependencies (is not loose coupling). Keep interfaces on a high level of abstraction to avoid components knowing too much about the implementation details (and thus become too interdependent). The book shows an example of the abstract factory which is described as a design pattern that successfully limits the amount of interface code exposed by a component. A well-balanced architecture, with not too many and not too few components, of uniform size, is the most modular and enables easy modification through separation of concerns. = a number of more or less balanced top-level components. Updating this codebase will be much easier! Cool how improvement of one guideline leads to improvement in another one. A large system is difficult to maintain, because more code needs to be analyzed, changed and tested. Also maintenance productivity per line of code is lower in a large system than in a small system. I have not a quick example of this, because most projects for this blog are relatively small, but I know from experience that the bigger the codebase the more complex it gets. This guideline recommends to not copy and paste code, refactor existing code, and use third-party libraries and frameworks to avoid unnecessary over-engineering. Automated tests (that is, test that can be executed without manual intervention) enable near-instantaneous feedback on the effectiveness of modifications. Manual tests do not scale. Here I need to get a bit more into the TDD-habit yet. I have been adding tests being late in the development cycle, ideally you do this when writing the code or even drive your design by testing, because you get in the habit of thinking about how your code can be tested. The immediate feedback and safety net of a regression suite, makes you less afraid to make changes which is an important requirement with ever-changing business rules. Having irrelevant artifacts such as TODOs and dead code in your codebase makes it more difficult for new team members to become productive. Therefore, it makes maintenance less efficient. True, I still use comments to document not so obvious things, but you should wonder: if it requires comments, shouldn’t it be refactored / redesigned? Especially commented code can be very confusing. No worries: git still has copies of everything! More importantly long comments don’t tend to stay up2date with code changes turning well-intended comments into lies. Apart from taking away the need for commenting you got the complex logic in a method which is now easier to change or expand. Yes, it adds some lines of code, but I rather pay in length than having code that is harder to read and maintain. And that’s it: 10 simple guidelines. Reading about them however only helps you so much, the real benefit comes from reminding yourself on a daily basis as you code. It should become an attitude, a way of crafting software. As with everything: practice, practice a lot and this will become second nature. As said this book is preparation for the Quality Software Developer Foundation Certificate in Maintainability. There is an accompanying video training available as well. Article: Why Measuring Code Quality Matters. 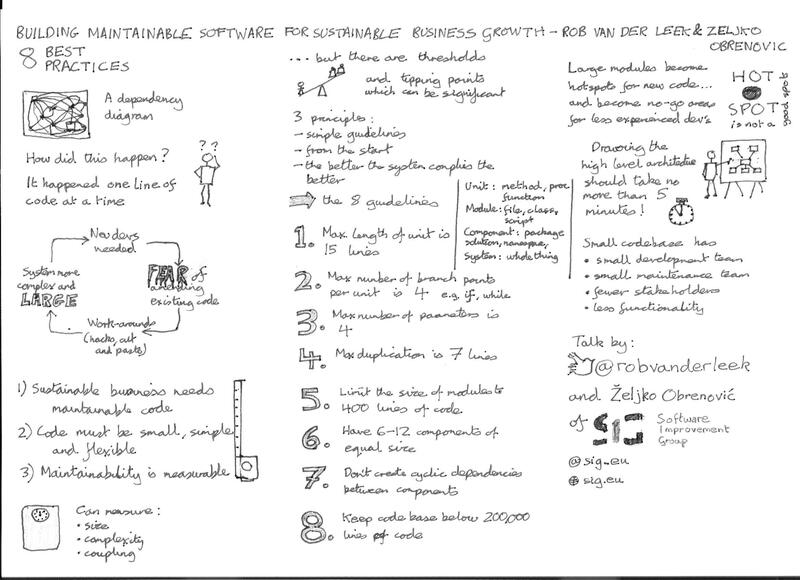 Software Improvement Group: About SIG. See my reading page for more books on software quality.